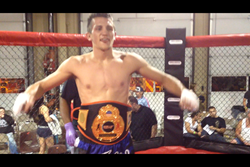 Steven Eilola, of Port Deposit Maryland, wins his MMA bout in a 5 round war to become the new Stellar Fights Light Weight Champion. I wanted to challenge myself against the toughest. This past Saturday Steven "The Sniper" Eilola, a fighter from Top Flight MMA, stepped back in the cage at Stellar Fights 23 to win the vacated light weight title against a powerful contender in Jon "The Bull" Mosely. Like Eilola, Mosely is another up and coming MMA fighter with his own pair of impressive victories in the Stellar Fight cage. In this 5 round war Eilola and Mosley treated the crowd to big slams, smooth submission transitions, powerful strikes. Ultimately earning the win for the "Sniper" was his control of the grappling exchanges. Eilola nearly finished the bout with of series of triangle, arm bar, and rear naked choke attempts. Mosley would escape every submission attempt causing the crowd to erupt, as each submission seemed to be the one to end the fight. To close out the 5th and final round, Eilola landed a thunderous left kick then poured on serious ground and pound leather to solidify his unanimous decision victory. Eilola had this to say about his championship victory," I wanted challenge my self against the toughest so that's why wanted to challenge John for the light weight belt. I feel so grateful right now, my team prepared me well, It was a rough training camp to prepare for John but it all paid off tonight and it feels great. Thanks to my Top Flight teammate, to my family, and everybody that supports me". Eilola did most of his training in belcamp at Top Flight MMA but he also trained with his team Lloyd Irvin in Camp Springs Maryland getting the opportunity to spar with UFC fighters Mike Easton and James Vick, who was also victorious Saturday at the UFC event in Oklahoma. Eilola has normally competed at the welter weight division (170lb) which is his natural walk around weight dismissing the need to cut weight but after this (his first) successful weight cut, he has found a new home in the light weight division has the champ.